MOSCOW AIRPORT. RUSSIA. 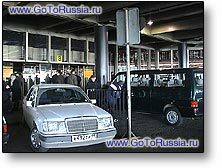 International airports in Moscow: Sheremetyevo (SVO), Domodedovo (DVO), Vnukovo (VKO): transfer, taxi service, driver, customs, passport control, phones. DIRECTION FOR THE MEETING IN THE AIRPORT SHEREMETYEVO-2. TimeTable. Please read this information and you will be absolutely aware of all the details and niceties arising during the meeting in the international airport Sheremetyevo-2! Once you get through customs of international airport Sheremetyevo-2, you will walk out into the dark public area where you can be met. If your flight lands earlier than the time scheduled please wait till the appointed time. Exactly in stated time our driver will enter the airport building with the table and surely you will see him! Here you will be awaited by our driver holding the table with your name or the name of your company. Mostly the Arrivals is crowded and you could occasionally pass by our driver and do not notice the table with your name! In this case please return back and look for our driver. If you do not succeed in getting through the crowd you could simply use the telephone but please do not give up and try to find another taxi! 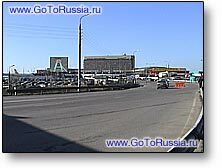 How to find telephone in the airport Sheremetyevo-2? It is very easy! It is located in the Arrivals behind the escalator. It is easy to find and easy to use - you leave a bail in the amount of 10-15 rubles ($0.5) to the cashier and call your taxi service. Before you hang up the receiver your driver will come to you! Another telephone is located on the second floor of the airport building where you can get to by escalator or elevator! After meeting with your driver he will ask you to wait 3-4 minutes near the arrival indicator before he will drive the car from the parking place to the airport entrance! In 3-4 minutes the driver will park the car near airport entrance, load your luggage and help you to get into the car! You could make payment upon your arrival to the destination that will save your time! Please, apply for transfer services to our partner www.GOTORU.com! 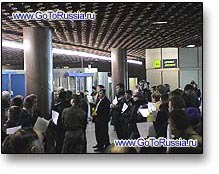 See VIP SERVICE information in Sheremetyevo-2 airport. We hope you will enjoy staying in Moscow!